We're dashing into the height of spring stone fruit season and I couldn't be happier. I've just spied the first blush of apricots so they are among my gorgeous new purchases. Let this be a signal to all that we're now solidly into that time of year when we really have to get busy making the most of the season's offerings. 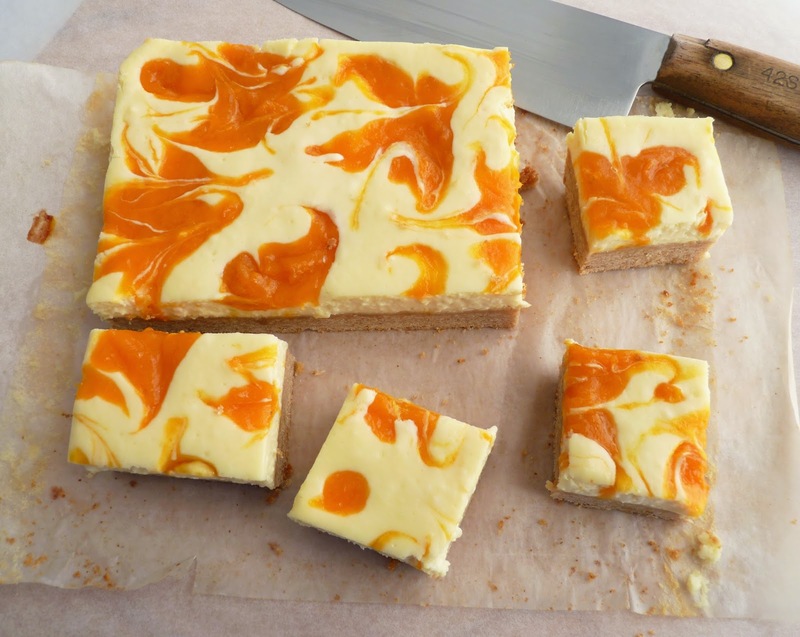 These are very easy cheesecake bars that provide a substantial chewy crust topped with a cream cheese layer and a swirl of fresh tart apricot puree. The apricots are simmered with some sugar for about 5 minutes, just long enough to coax their full flavor. I prepared the base for the bars and the apricot puree in a food processor. I switched to an electric mixer for the cream cheese filling so I wouldn't beat too much air into the mixture. The base is baked about 15 - 20 minutes and then the filling is added and baked for another 20 - 25 minutes. Cool and chill and presto! You have some bright and lovely spring bites to enjoy. 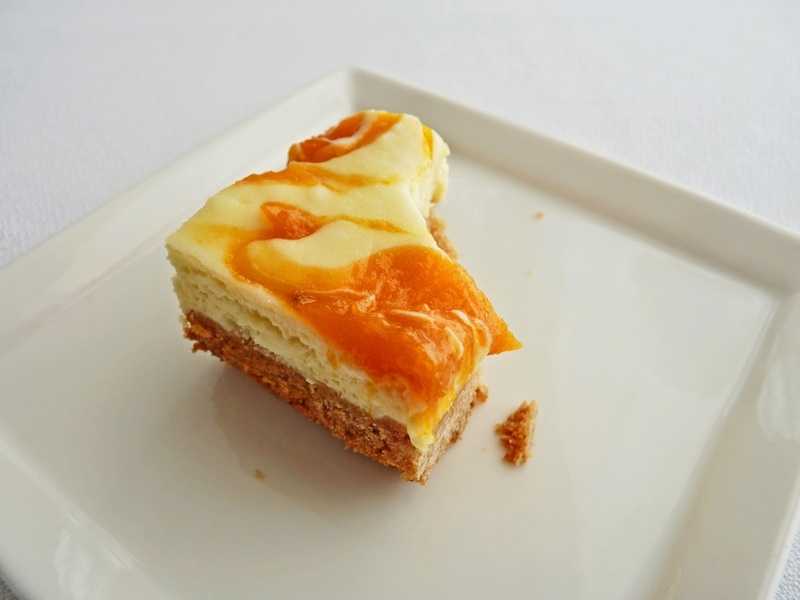 - Recommended: I doubled the ingredients for the apricot puree and used half for the cheesecake. 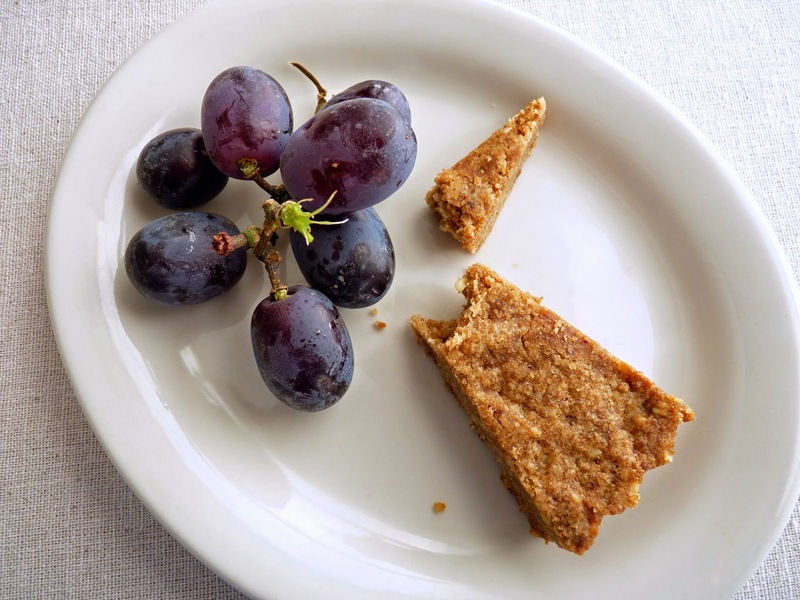 The remainder can be stirred into plain yogurt or warm oatmeal or slathered on fresh biscuits or scones. - You can recycle a quarter-piece of dried vanilla bean from your vanilla sugar jar to use for the apricots. I do this to flavor pastries and desserts when vanilla isn't the star ingredient. So save your used vanilla pods: wash and dry them out, cover with sugar and store in a sealed jar. They will still impart a lot of flavor. You can even finely grind the casings to a powder and use them. - Be sure to lower the heat to 325 degrees F once you've baked the base. - Room temperature cream cheese is important for a smooth filling without lumps. 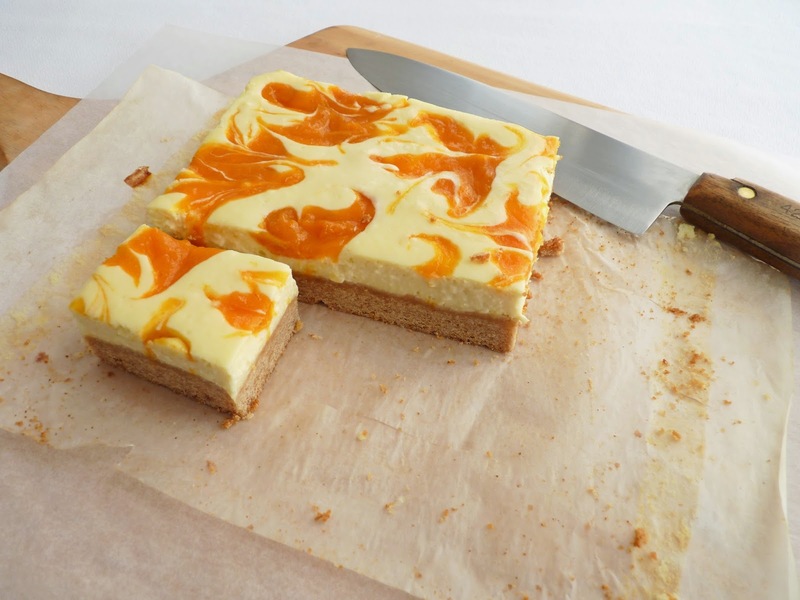 - Once baked and cooled, chill the pan until the cheesecake is firm enough to slice. Then let the bars warm up a bit for the best texture of the base. 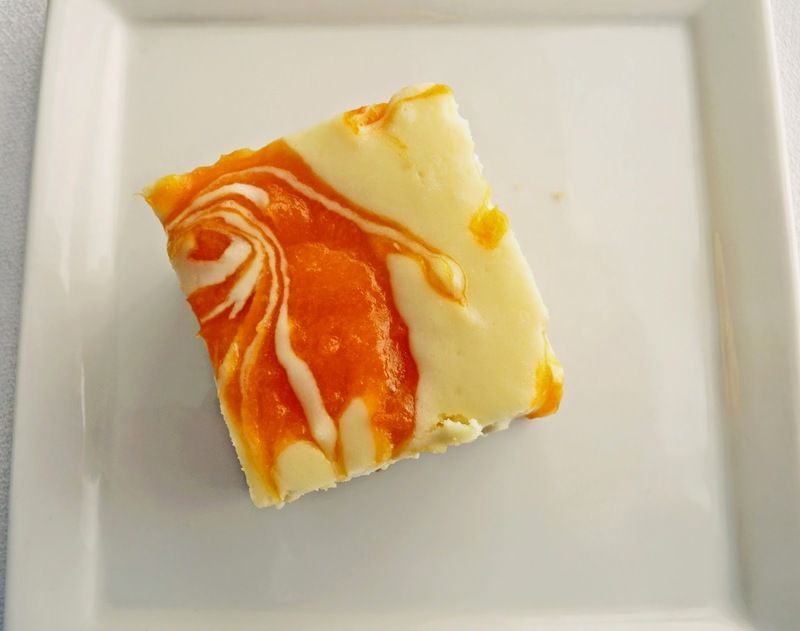 - Store cheesecake bars in an airtight container in the refrigerator. Cut apricots in half, remove pit and slice each half into 4 wedges. Place in a small saucepan with the sugar, honey and a piece of split vanilla bean. Bring to a simmer over medium-low heat, stirring to prevent scorching. When sugar is dissolved, reduce heat and continue to simmer on low until the apricots have softened, about 4- 5 minutes. Set aside to cool. Combine the flour, both sugars, baking powder, cinnamon and salt in the bowl of a food processor and process until the ingredients are combined. Cut the cold butter into 1/2" pieces and add to the dry ingredients. Process until it looks like coarse meal. Combine the egg yolk, milk and vanilla and add. Process until the mixture starts to form large clumps and holds together when pinched. Press the dough clumps into the prepared pan to form an even bottom layer. Bake until the crust is puffed up and the surface looks dry and slightly browned, about 15 - 20 minutes. Lower the oven temperature to 325 degrees. Beat room temperature cream cheese and sour cream until smooth. Add the sugar, vanilla and lemon juice and combine thoroughly. Scrape down the bowl, add the egg and mix until smooth. Pour into the crust and smooth out evenly to the edges. There is absolutely no arguing against the desire for shortcake at this time of the year. But instead of buying pre-made shortcakes in cellophane wrap, take just a few minutes for a light romp in some flour, butter and sugar to make your own. Once you try this, you'll never go back. Homemade shortcake presents you with an ultimate pleasure: soft, tender, every-so-slightly-sweet biscuit type bites that would make anyone swoon with love and devotion. I've had lots of fun making various versions of shortcake over the years. 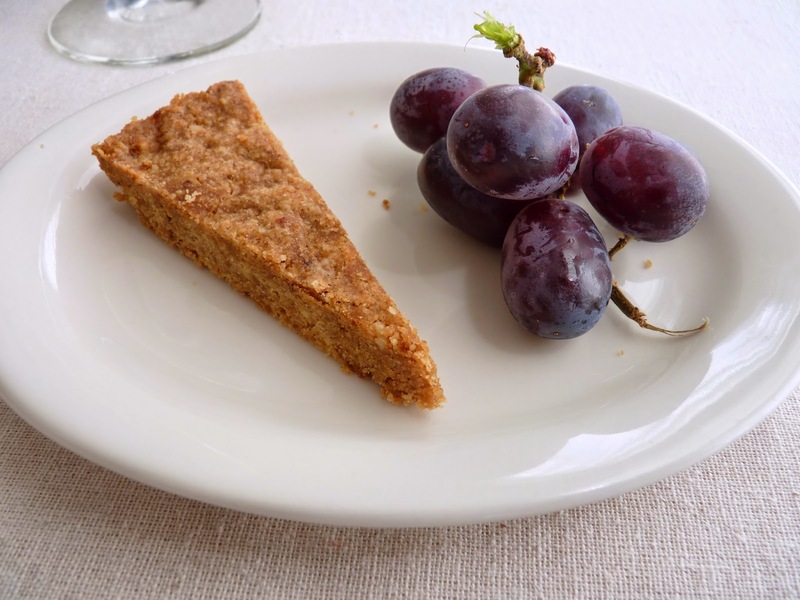 I've added pecans to serve with peaches, oatmeal to pair with plums, buckwheat to enjoy with blueberries and plums, sour cream to enhance tenderness and cornmeal to add a slight bit of texture. This iteration makes good use of almond paste to infuse with a subtle flavor that goes perfectly with the season's fresh fruit. Berries are in great abundance at the moment and stone fruit and figs are right around the corner. This shortcake would be a perfect partner with all of them. Add a good dollop of freshly whipped cream and there's really nothing like it. Fresh, easy and truly a phenomenal pleasure. 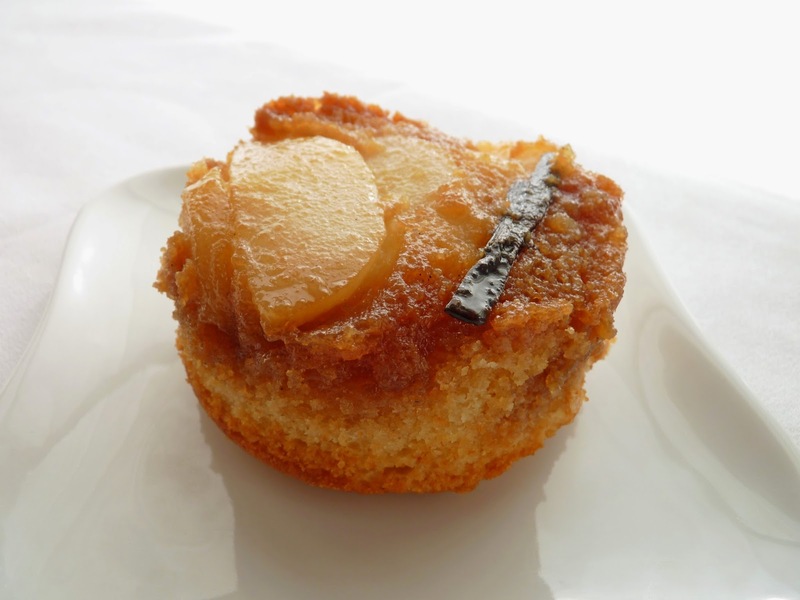 - Almond paste is not the same as marzipan, which has a lot more sugar added to the almond paste. I like Odense brand, which comes in a box containing a 7 oz log wrapped in foil. This recipe calls for 3 1/2 oz or half a log. You can wrap the other half tightly in plastic, place in a zipped plastic bag and store in the refrigerator for quite a while. Bring it to room temperature to let it soften before using. Another great use for 3 1/2 oz of almond paste: Brown Butter Almond Cake and Chocolate Almond Cake. 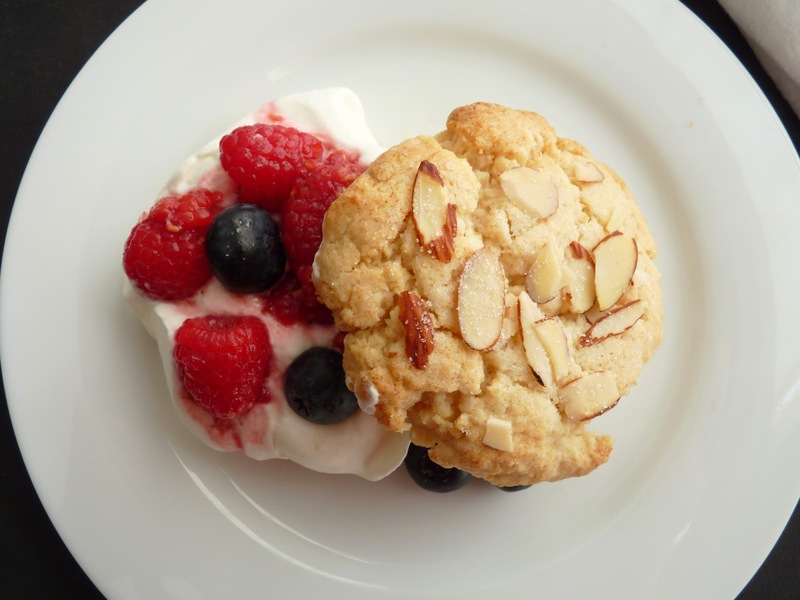 - For the best shortcake texture, process the almond paste with the sugar until it's very finely ground and looks fairly homogeneous with the sugar. 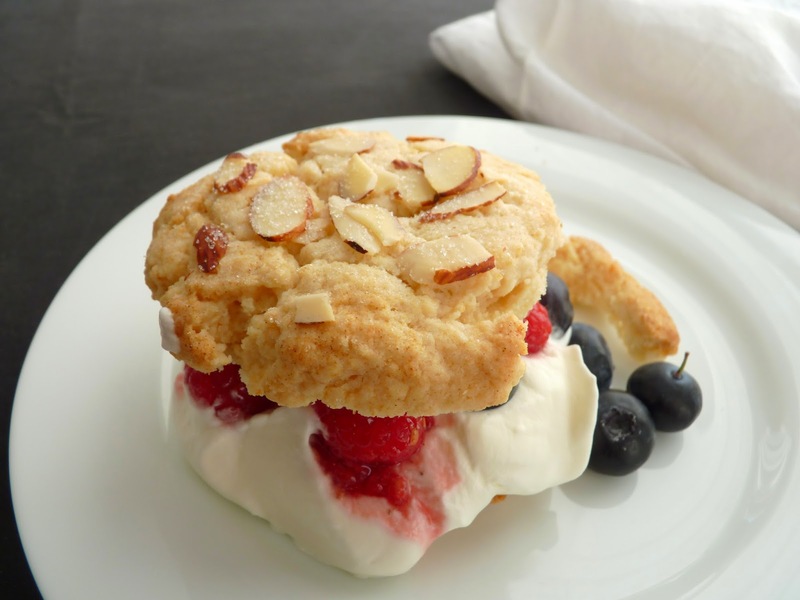 - The secret to great shortcake is a very light touch when mixing and forming the dough. This recipe requires very little handling for maximum tenderness. There are just a few things to remember: 1) Both the butter and the cream must be very cold. 2) Work fast to incorporate the butter so it doesn't warm up. 3) Use a fork to stir in the cream with only about 10 - 12 rounds of stirring. The dough will look lumpy. 4) Place the dough on a very lightly dusted work surface and pull it together with 3 - 4 very light kneads. You don't want to overwork it but you also don't want a pile of clumps. 5) Using a floured biscuit or cookie cutter, press down to form the shortcakes and lift straight up when you're done. To prevent sealing the edges, no twisting or turning the cutter. - For some reason, you'll get more loft and height to your shortcakes, biscuits and scones if, after cutting them out, you turn them upside down and then place them on the baking sheet. Strange but true. - I use a serrated knife and a sawing motion to cut the shortcakes in half. 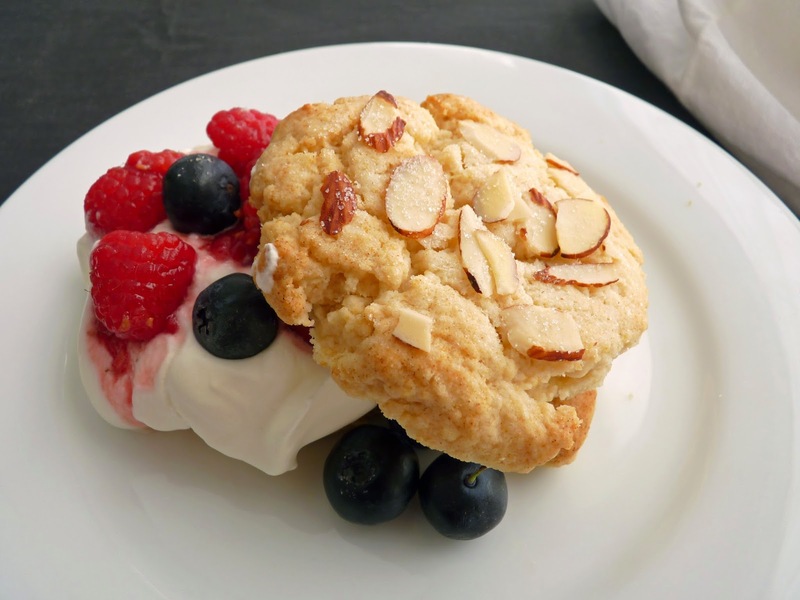 - Shortcakes are best when served immediately after they've cooled. Preheat oven to 425 degrees F. Line a baking sheet with parchment or a silpat. If your oven runs hot, double stack 2 baking sheets to prevent the bottoms from browning too much. Finely chop the almond paste and place in a food processor with the sugar. Process until the paste is broken into fine granules and blended with the sugar. Add the flour, baking powder and salt and process to combine. Pour into a bowl. Cut the cold butter into small pieces and add to the flour mixture. 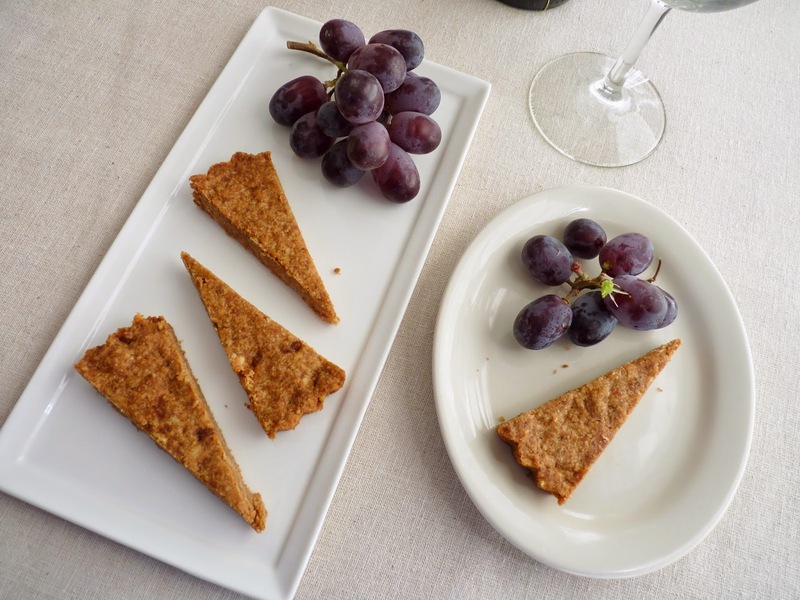 Using your fingers or a pastry blender, press the butter into flattened pieces the size of oatmeal flakes, tossing and coating the butter with flour as you go. Make a well in the center. Combine the cream and vanilla and pour into the well. Stir with a fork, making just about 10 - 12 rotations. Stop mixing when it starts to come together and the cream seems fairly absorbed. Gather the loose and lumpy dough with your hands and press it together very gently 2 or 3 times. Place the dough on a work surface lightly dusted with flour. Pat and shape into a round about 1" thick. Using a round 2 1/2 cutter dipped in flour and a straight up and down motion, cut out 6 shortcakes. Place them upside down on the prepared baking sheet. Brush with melted butter and garnish with sliced almonds. Sprinkle lightly with sugar. Bake until golden brown, about 12 - 14 minutes. Place on a wire rack to cool. Combine the berries with the sugar and set aside for about 15 minutes, stirring a couple of times to distribute the juices. When ready to assemble, whisk the heavy cream, sugar and vanilla until soft peaks form. Cut the shortcakes in half and place the bottom halves on serving plates. Dollop with whipped cream and berries. Top with remaining halves. 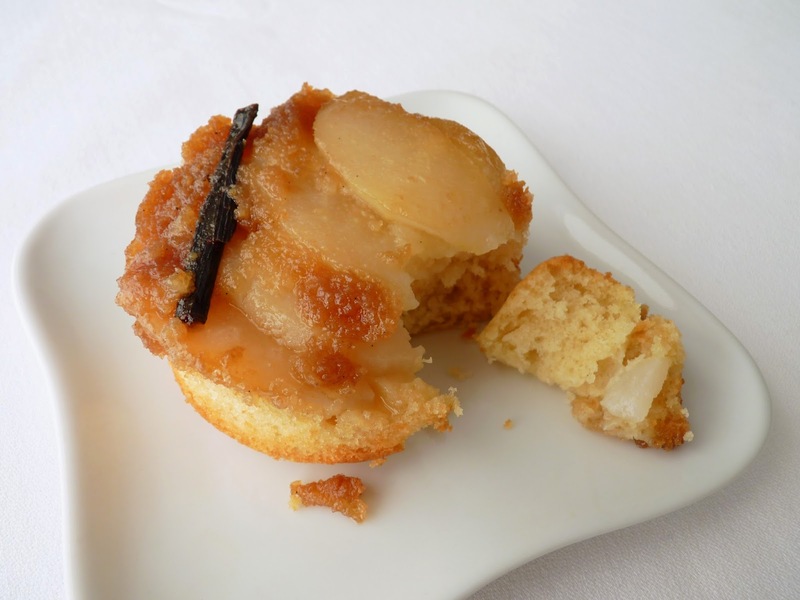 Just before we get ready to greet the gorgeous apricots and cherries of May with unbridled glee, I'm making these sweet little cakes loaded with pear and a nip of brandy. They are a simple but elegant way to end a meal or begin a celebratory Sunday brunch along with a good strong and steaming hot cup of coffee. Pears are available throughout the year and are one of my favorite fruits. They are subtle in flavor and texture and so delicious on their own but also bake nicely in pastry and poach beautifully as a versatile compote for ice cream, cake and shortcake. The smell of these cakes baking is heavenly and they turn out of their ramekins nicely on the plate. The golden caramel combined with the sumptuous pear make this very hard to resist any time of the year. So grab a fork and relax. This is a no brainer. - My ramekins are 4 1/2" x 2". But use what you have, keeping in mind if the diameter of your ramekins is smaller, the cake will likely take a couple of minutes longer to bake. - If you don't have a vanilla bean for the topping, substitute 1 1/2 teaspoons vanilla extract and add along with the brandy. - I used D'anjou pears. They should be ripe but not mushy. Bartletts or ripe Boscs would also work. - An ice cream scoop makes it easy to portion the cake batter. - If you're in the mood to gild the lily, serve with a scoop of vanilla ice cream or a dollop of slightly sweetened and brandied whipped cream. - The recipe could just as easily be made into one 9" cake to serve 8 people. Bake until a tester comes out clean, about 45 - 50 minutes. Preheat oven to 350 degrees F. Lightly grease the sides of six 4 1/2" diameter x 2" depth ramekins. To make the topping, place 2 oz butter in a saucepan. Split and scrape the seeds from the vanilla bean and add to the butter along with the casing. Melt the butter over low heat. Add brown sugar and cook, whisking to combine, for about 2 - 3 minutes. Whisk in the brandy and a slight pinch of salt and remove from heat. 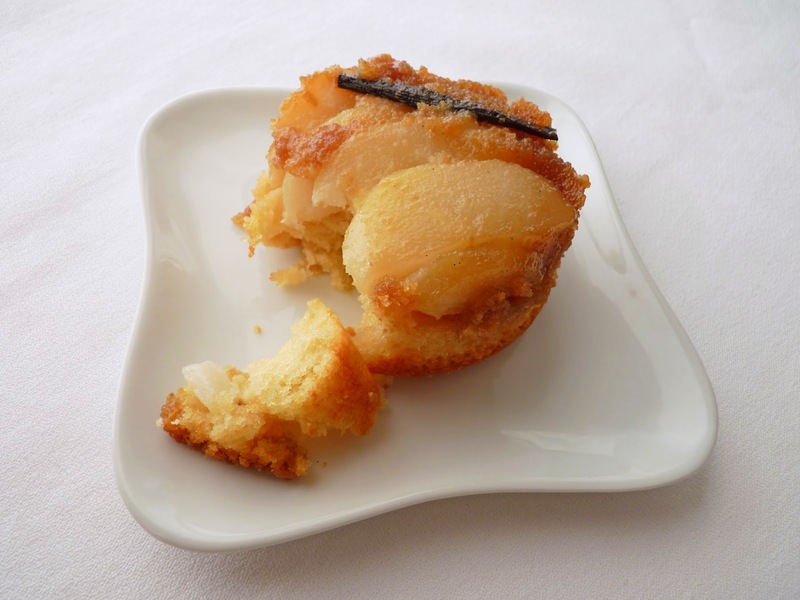 Remove the vanilla bean casing and distribute the topping in each of the ramekins. Peel and core the pears and cut into 1/4" slices that will fit into your ramekins. Arrange them on top of the sugar mixture. Place the ramekins on a baking sheet and set aside. Sift the flour, baking powder and salt. Combine the brandy and vanilla with the milk. Beat the butter and granulated sugar until light and fluffy. Add eggs one at a time, beating well and scraping down the bowl after each addition. Add a third of the flour mixture alternately with half the milk, beginning and ending with the flour. Mix just until blended, scraping down the bowl to incorporate everything together. Portion the cake batter in each ramekin and spread to the edges. Bake until golden and a tester comes out clean, about 30 minutes. Place the ramekins on a wire rack and cool for 10 minutes. Invert the cakes onto serving dishes and cool. Serve warm or at room temperature. 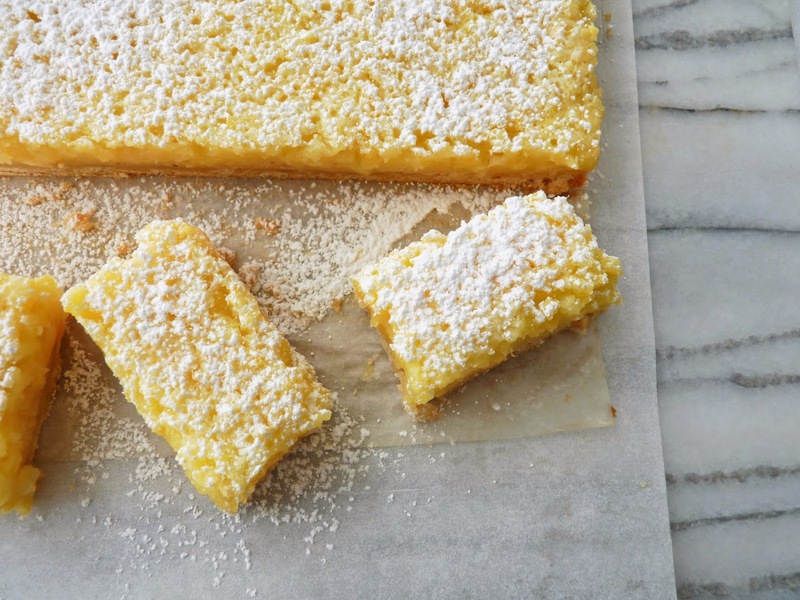 This is a lemon bar to end all lemon bars. It's fairly reminiscent of the idea for a Shaker Pie, the classic American dessert developed by the Shaker religious communities of Ohio. Their recipe calls for slicing whole lemons ultra thin and macerating them in sugar overnight to release their juices and tenderize the skin and pith. 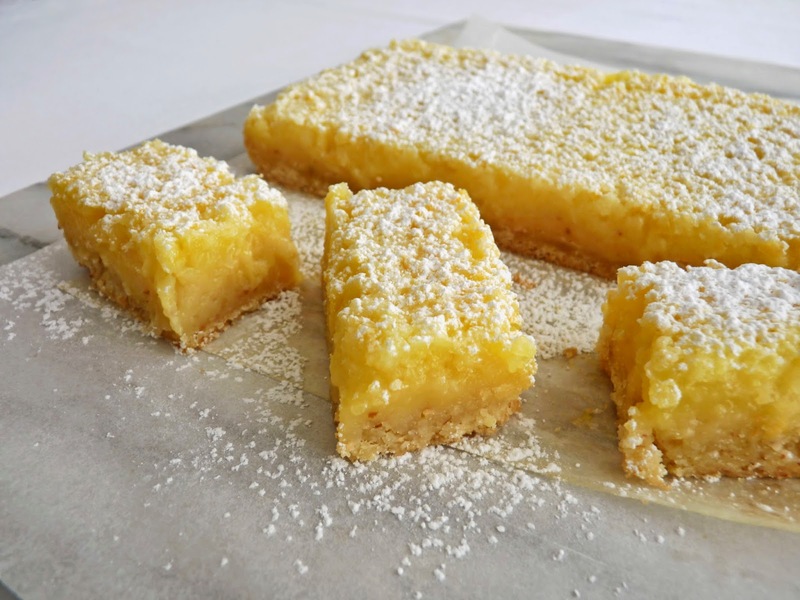 The recipe for these lemon bars is from David Lebovitz. Rather than slicing the lemons, he makes good use of a food processor to pulverize and combine all the filling ingredients, which include sugar and melted butter to temper the tartness and egg and cornstarch to bind the mixture. The base is a simple pastry crust. 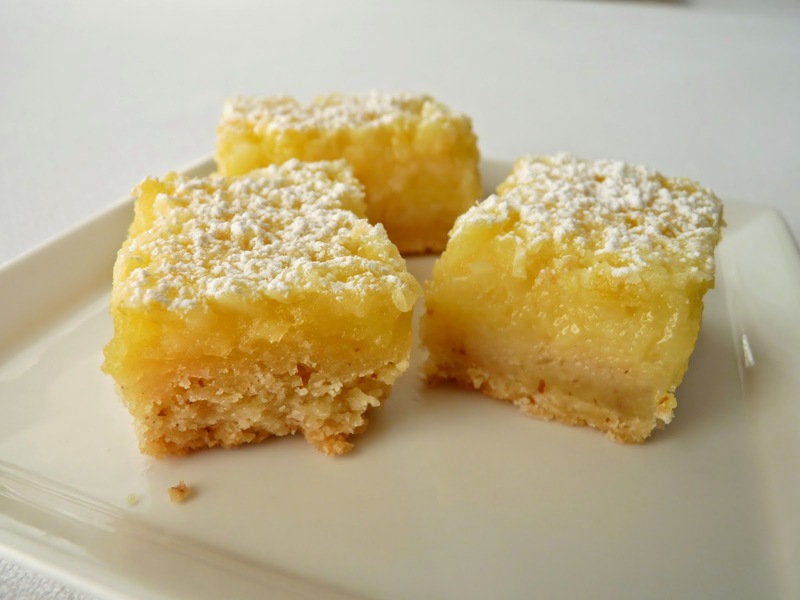 Upon first bite, I experienced quite a pucker, which is to say these lemon bars are not nuanced in any way. They are super delicious and quite tart. They seem to tame down a bit the second day. And then what I realized when I had another go is they are mellowed a bit if you choose lemons that have a thin skin rather than a thicker one to cut down on some of the bitterness of the pith. When served to other tasters, they proclaimed them the best lemon bar ever. 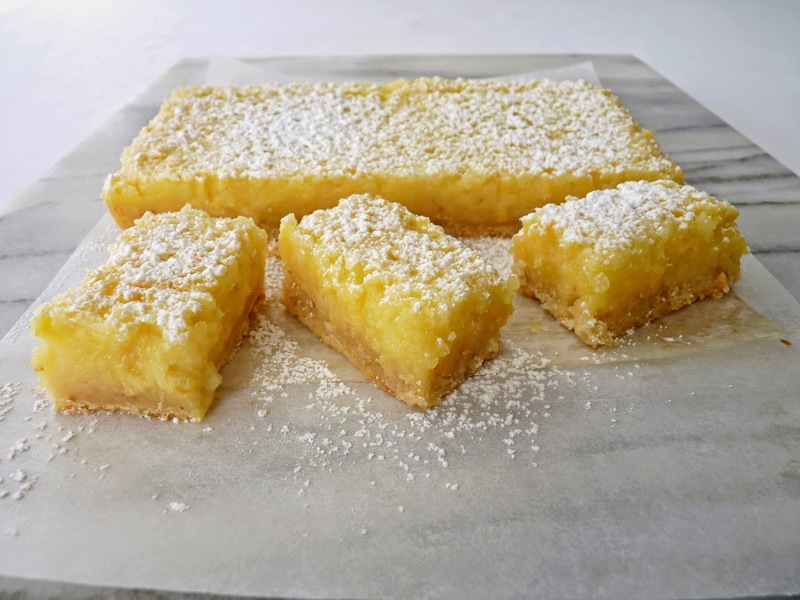 So if you're in the mood for a distinctive lemon experience that will light up your taste buds, this is the lemon bar for you. 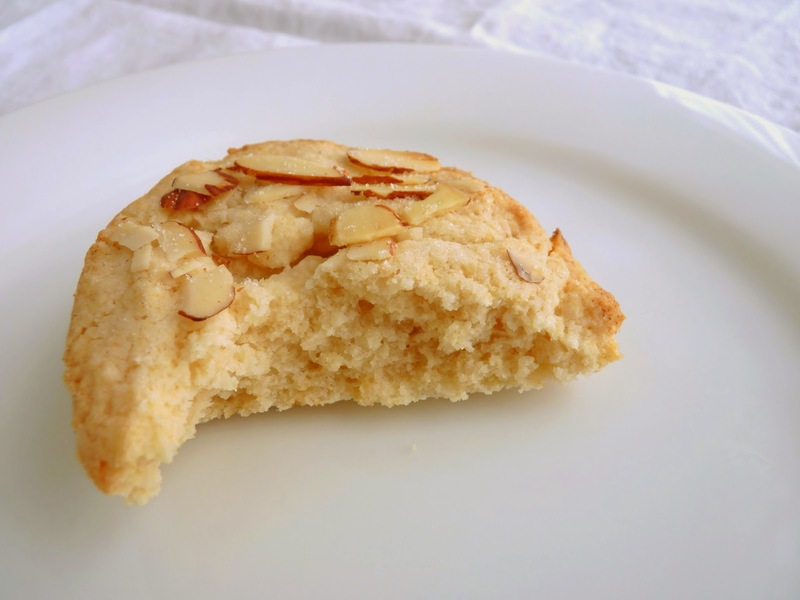 - I used my recipe for Almond Tart Dough as the base: Place 1 cup (5 oz) flour, 1/4 cup (3/4 oz) toasted sliced almonds, 3 tablespoons (39 g) sugar and 1/4 teaspoon salt in the bowl of a food processor and process to combine. Add 4 oz (8 tablespoons) cold butter cut into 1/2" pieces and pulse just until the mixture looks like coarse meal. Add 1 egg yolk and 1/2 teaspoon vanilla and process until the dough just starts to clump. Press evenly into prepared pan. - Since the recipe incorporates the whole lemon, choose organic or unsprayed. - David says he used 1 lemon that weighed 6 oz. That's a pretty big lemon! I wound up using 2 smaller medium-sized ones to get to 6 oz. Don't worry about getting the exact weight. - When you're pureeing the filling, there will be a few tiny bits of lemon remaining, which will add to the texture. - The cooled bars will keep in an airtight container at room temperature up to three days. You can also freeze them in airtight packaging up to one month. Bring to room temperature before serving. 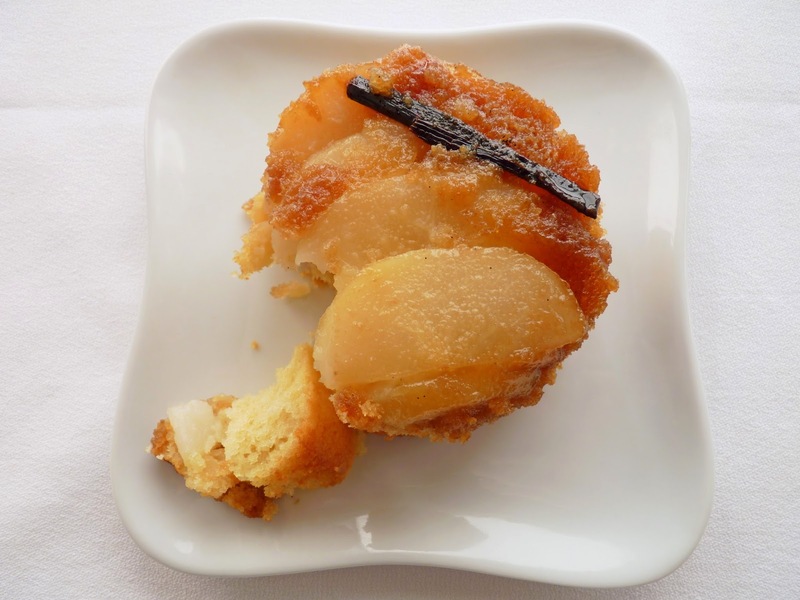 - If you try this recipe with Meyer lemons, you may want to reduce the sugar in the filling. Preheat oven to 350 degrees F. Lightly grease an 8" square pan and line with parchment with a slight overhang on two sides. For the pastry crust, whisk together the flour, sugar and salt until combined. Add the melted butter and vanilla and stir with a fork just until smooth. Press into the bottom of the pan, distributing the dough as evenly as possible. Bake the crust until it's golden brown, about 25 minutes. Reduce the oven temperature to 300 degree F.
For the filling, cut the lemon in half and remove the seeds. Cut the lemon into smaller chunks and place them in the bowl of a food processor or blender along with the sugar and lemon juice. Process until the lemon is finely chopped. Add the eggs, cornstarch, salt and melted butter and blend until almost smooth. Pour the lemon filling over the hot crust and bake for 25 minutes or just until the filling stops jiggling and is barely set. Remove from the oven and place on a wire rack to cool completely. Carefully lift and remove the cooled pastry from the pan using the parchment overhang to assist. 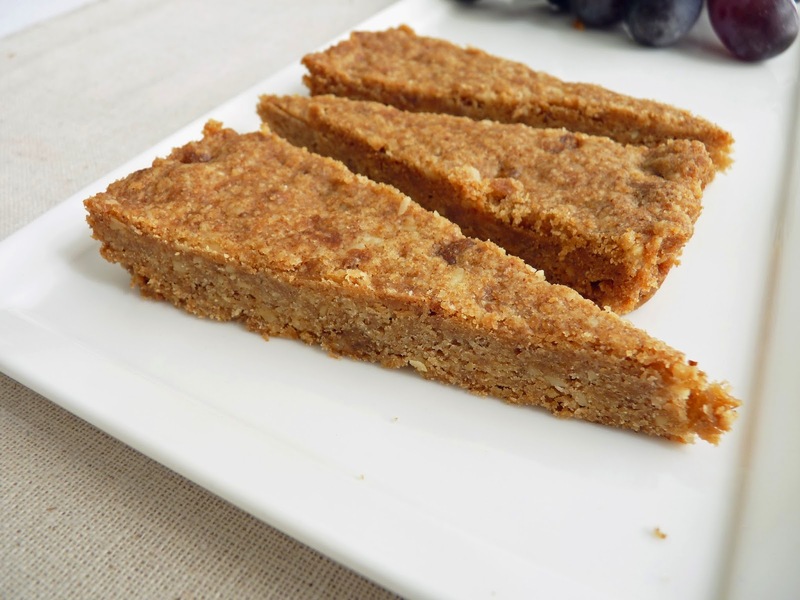 Cut the bars into squares or rectangles and sift powdered sugar over the top just before serving.